This notion seems firmly rooted in popular culture despite many efforts to debunk it (Hughes, Lyddy, & Lamb, 2013). It was the basis of the movie Lucy (2014), which depicted what supposedly would happen if a person actually used all 100% of her brainpower. It has been used to justify belief in pseudoscientific psychic powers and is a tacit assumption in many self-help programs designed to “unleash” untapped human potential. Hughes, et al. (2013) found that this misconception (hereafter called the 10% Myth) is one of the most prevalent misconceptions among the public. More concerning is the finding by Dekker et al. (2012) that about 50% of primary and secondary teachers across different cultures also endorse the 10% Myth. There are a plethora of articles and videos debunking this myth both in popular media and from neuroscientists. What’s more, neuroscientists now have tools for creating images and tracking the activity of living, functioning brains. The best known of these are PET (Positron Emission Tomography) scans and fMRI (functional Magnetic Resonance Imaging). These techniques, which have come into common use in the last 25 years or so, have revolutionized our understanding of brain function. In PET scans, a biologically active radioactive tracer is injected into the subject (for the brain, this is usually a form of glucose). The tracer is metabolized by the brain and in doing so, positrons are emitted. The more active the brain structure, the greater the positron emission. Sensors detect the positrons through gamma radiation and then a computer can construct a three dimensional representation of brain activity based on tracer concentrations. If we only use 10% of our brain, then a PET scan should look like Slide 2 in the accompanying PowerPoint slides. The blue outline is the skull, and the circle of color indicates active brain structures. Most of the brain would be dark because of inactivity. (You are looking down on top of this person’s head). But that isn’t how the PET scan actually looks. Slide 3 shows an actual scan of a healthy person. The entire brain is constantly active, even in periods of sleep: regulating, monitoring, sensing, interpreting, reasoning, planning, and acting. Even people with degenerative neural disorders such as Alzheimer’s and Parkinson’s disease still use more than 10% of their brains. For a good video clip of a neuroscientist debunking the myth, as well as a case study of a man who only has 10% of his brain, see McDonald (2016). Most of us feel as if we lived habitually with a sort of cloud weighing on us, below our highest notch of clearness in discernment, sureness in reasoning, or firmness in deciding. Compared with what we ought to be, we are only half awake. Our fires are damped, our drafts are checked. We [p. 323] are making use of only a small part of our possible mental and physical resources. Note that James is saying we often don’t feel fully energized, both physically and mentally. He in no way claims that we only use a small portion of our brain. In fact, he was observing how decorum, social norms, and routine fail to engage all of people’s resources. His statement is actually consistent with what we now know about attention and flow states, but James clearly was not claiming that most people perpetually use only 10% of their brainpower. The starting point of the unit is the 10% Myth itself. Consider assigning Assignment 1 below before the first class and centering the class on discussion of that assignment. This will prepare students to understand how all parts of the brain contribute to behavior. 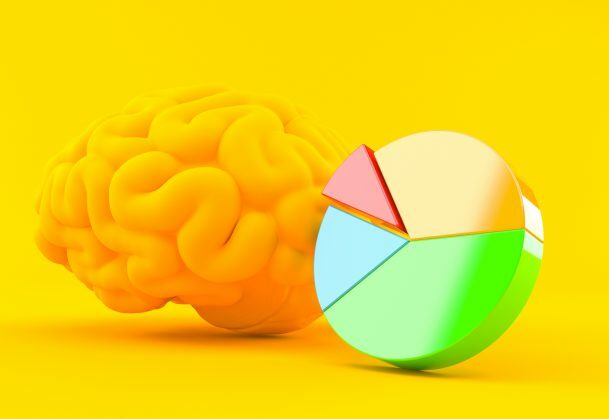 Begin by showing Slide 1 in the accompanying PowerPoint deck and asking who has heard of the 10% brain myth and what they have heard about its validity. Show Slides 2 and 3 to show how brain scans reveal how all parts of the brain influence behavior. The online article by McDonald (2016) links to a nice accompanying video of a neuroscientist debunking the myth in more detail. This article also discusses a rare case where a man has only 10% of his brain and it’s unknown how he manages to live a fairly normal life. The stage is now set to discuss various brain structures and their contributions to behavior. Have each member of a group explain what their assigned brain structure does and their answers to the assignment. Have the group decide which brain part they would most and least be willing to lose. You can also go over the major brain structures or the gross features of the brain. Slide 4 contains a concept map of the nervous system that can be shared with students and used to organize the presentations. The second class meeting can take several different directions. A concept map of the entire topic of brain and behavior is included in the PowerPoint slides. One option is to discuss the lobes of the brain and the function of each, then discuss the structure and function of neurons, including axonal and synaptic transmission. This is a chance to talk about important case studies in neuroscience (e.g. Phineas Gage, H.M., and Clive Wearing), single cell recording techniques as well as advancements in brain scans. A second option is to introduce the evolution of the brain across species and comparative psychology. A third option is to discuss how neuroscience relates to the question of whether or not human free will exists. Assignment 2 (below) is designed to spark this discussion. If something goes wrong in someone’s brain, are they really responsible for their actions? research on traumatic brain injury, including recent work on contact sports such as football and boxing and the prevalence of brain injury in war veterans. The following formative assessment questions allow both you and the students to gauge their level of understanding of the unit. When using these concept checks, be sure have students respond individually so both you and the students can see how well the class understands the concepts. Then they can discuss as pairs or as a class. There are a variety of high tech (clickers) and low tech (fingers) methods that can be used to administer these concept check questions. I. Which of the following statements is true? D. The average person lives a life of unstimulating routine and habit and only uses about 10% of his or her brain on a regular day. IV. You meet a man who can no longer learn new facts. He has ____ amnesia which is probably caused by damage to his ____. Everyone is susceptible to brain damage through head trauma, a cerebrovascular accident such or stroke, a brain tumor, or other conditions. In this assignment, you will consider the behavioral and mental consequences of damage to a major part of your brain. What behaviors are associated with that part of the brain, and what are the possible consequences of damage or loss of that part? How would the brain damage affect your life – specifically, how would it alter your current life and your life ambitions? How and to what extent could you compensate for the loss? In summary, you should describe in detail the behavioral consequences that the damage would have for you. You will be broken up into groups of six. Each of you will be assigned a brain part. Just count off and see which brain part you get to have damaged. Use the table below. Read the textbook description of these structures and their function. For additional help, here are some video resources from the “2-minute Neuroscience” on the YouTube channel Neuroscientifically Challenged: You are welcome to use other resources, but you are responsible for the credibility of these sources. Be sure to cite any external sources you use. Your written responses are due by class time. On that day, you will explain what you have found with the members of your group. Bring copies to share with them in addition to the copy you will turn in to me. Your answers should be based on information from credible sources. A good answer will reflect a thorough understanding of concepts, critical reflection and clear, coherent, persuasive arguments. Clarity, organization, and writing style count as well as references and content. Taylor is at a party. When distracted, someone puts a psychoactive drug in Taylor’s drink. Although normally easy going, the drug causes Taylor to become loud, aggressive, and violent. Taylor gets into an argument with other partygoers and assaults a couple of them before being subdued. Taylor is arrested, but once the drug wears off Taylor is appalled by the violence and deeply remorseful about the incident. Should Taylor be arrested and tried for the assault? Why or why not? If yes, would you vote to convict if you were on the jury? Would your feelings be different if you were one of Taylor’s victims? If Taylor is convicted, should Taylor be incarcerated for the assault and for how long? Explain your reasoning at each step. Complete Part 1 before moving on to Part 2. Taylor is normally easy going but over a period of months, becomes progressively more violent and aggressive. Finally, Taylor gets into an argument with other people at a party and assaults a couple of them before being subdued. Taylor is arrested, but a brain scan at the hospital reveals a brain tumor pressing on Taylor’s hypothalamus. Once this tumor is removed, Taylor’s aggressiveness vanishes. Taylor is appalled by the violence and deeply remorseful about the incident. Did you react differently to the two scenarios? How is the first scenario different from the second one, or are they fundamentally the same? Your answers to these questions bear on key questions of human nature. Do people really have free will or are they bound by their brain activity? It bears on how we view the causes of crime and other kinds of antisocial behavior. It has important implications on the question of personal responsibility in society. Do we always hold people personally responsible for their actions? If not, under what conditions do we excuse them? Can society function in a lawful and orderly way if we do not hold people personal responsible for their behavior? Finally, it has implications for society as a whole. What if we could detect brain structures or genes that make it likely a person will develop destructive behaviors. How should we treat that person? For Part 3, reflect on your answers to Parts 1 and 2. Did you find a difference between the two scenarios? What do these articles say about our free will and choice? If our brain tells us to do something, can we somehow disregard it? What does this mean for our personal responsibility for our actions? Should “My brain made me do it” be a legitimate reason for all our behavior? How can we decide when we have a choice and when we are victims of our brain? Write a short essay about these questions. Come prepared to discuss your views in class. Traumatic brain injury is a risk in many professions, and usually safety precautions – such as wearing helmets — are taken to minimize the risk. In some conditions, such as military combat, the risk of traumatic brain injury is high despite safety gear. Contact sports, such as American football and boxing, also carry the risk of head injury. In sports, however, participation often starts at an early age and people participate in it for enjoyment. Now questions are being raised about the cost of participating in contact sports in terms of concussions and long-term debilitating brain injury. Is the enjoyment worth the risk, especially for youth? This is a PBS Frontline documentary on CTE, which is common among former professional football players and is now showing up in former collegiate and even some high school players. Mike Webster was the football player whose condition initiated the whole issue of concussions, repeated head trauma, and brain damage caused by football. Describe Mike Webster’s life, his football career and the aftermath. Do you think he understood the risks and consequences of playing football for his brain health? Do you think the NFL acted appropriately and in the best interests of the players? Do you think the glory he experienced justified his later deterioration? If you had a child who wanted to play football or some similar contact sport, would you let him or her? Nick Buoniconti is an NFL Hall of Fame linebacker who played in the 1970’s. This story and video describes his life now. Do you think he understood the risks and consequences of playing football for his brain health? Do you think the glory he experienced justified his later deterioration? He clearly has views on this now, but do you think young football players would think the same way? If you had a child who wanted to play football or some similar contact sport, would you let him or her?